In his first interview with the Global Fund Observer, and in the runup to the Sixth Replenishment, Global Fund Executive Director Peter Sands spoke about a fully-funded Fund’s crucial role in accelerating the delivery of SDG 3, the Fund's new framework agreement with WHO, domestic financing, absorptive capacity, and more. The Global Fund Board has approved another $229.4 million in funding for 16 country grants. The grants emanated from funding requests submitted by nine countries. The Board also approved $24.0 million for three multi-country grants. Interventions worth $127.4 million were added to the Unfunded Quality Demand Register. Of the $229.4 million for country grants, Nigeria led the way with three grants valued at $71.2 million. The Board approved $36.4 million for the Middle East Response 2, a multi-country grant that is six-country initiative aimed at HIV, TB, and malaria services for refugees and people in conflict areas in and around Iraq, Jordan, Lebanon, Palestine, Syria and Yemen. This funding is a continuation of a prior grant. The Executive Secretary of Mozambique’s Country Coordinating Mechanism was found to have embezzled $22,593 from Global Fund grant monies and was responsible for ‘non-compliant expenditures’ of $26,020 overall, including payments not supported by appropriate documentation. The OIG released a report on its investigation into the misappropriation of funds on 13 November 2018. The Secretariat is seeking the recovery of $24,587, which takes into account one reimbursement already made by the Executive Secretary. The Technical Review Panel recently released a report on RSSH investments in the 2017–2019 allocation period. Although there has been progress, the TRP found, a greater focus on resilient and sustainable systems for health will be required in the 2020–2022 allocation period if the Global Fund is to achieve its RSSH-related strategic objectives. The TRP analyzed 50 funding requests from Windows 1–5. This overview is one of three GFO articles on the report; the other two, on integrated health systems and human resources for health, will be published in a future edition of the GFO. An audit by the Office of the Inspector General (OIG) shows that Kenya has made significant progress against HIV, TB and malaria. This is partly due to the country’s ability to successfully procure and distribute Global Fund-supported health products. The OIG, however, found issues in the quality of services, measurement of grant performance and grant implementation in the context of devolution of health services from the central government to 47 county governments following constitutional changes in 2010. Kenya, Uganda and Guinea are three African countries at different levels of economic development, and with different epidemiology for the HIV, tuberculosis and malaria. The application of co-financing within their programming for the three diseases differs largely by country. It is important that the Secretariat harmonizes the application of the policy across countries despite the need for customization. A new report from ICASO published on January 8, 2019, highlights improvements in Malawi’s Global Fund program during the 2017-2019 funding cycle. The authors summarize the report’s findings for the GFO. The total funding requested for key and vulnerable populations rose dramatically, and service packages for these groups were defined in greater detail. According to the report, a broad and systematic community engagement process contributed to these positive changes. However, community monitoring initiatives are direly needed to ensure greater accountability during grant implementation. On January 11, 2019, the Global Fund Secretariat and French President Emmanuel Macron announced the Fund’s $14-billion target for its next three-year funding cycle, at a high-level meeting in Paris. The announcement comes ahead of the preparatory meeting for the Replenishment to be hosted by the Indian government in New Delhi on February 8, 2019. Aidspan has launched a mobile app for its English and French newsletters, the Global Fund Observer and the Observateur du Fonds Mondial, now accessible for both iOS and Android users. The app is available free of charge in the Google Play and Apple stores. As part of a larger package of approvals in December, the Global Fund Board approved a $36.4 grant known as the Middle East Response. This is the second time the several-country arrangement has been funded as such, but now includes an expanded remit. 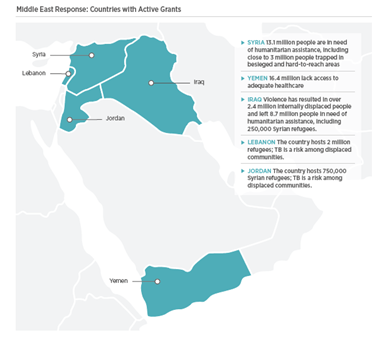 The Middle East Response 2 (MER2) grant covers five countries in the Middle East region (Iraq, Jordan, Lebanon Syria and Yemen), and aims to provide essential HIV, TB, and malaria services to populations in these countries. The MER initiative was created by consolidating the country allocations for Syria, Yemen and Palestine under one integrated grant-management platform and governance framework, tailored to address healthcare in the context of protracted conflicts (in Syria and Yemen) and a refugee crisis. Image: The Global Fund to Fight AIDS, Tuberculosis and Malaria, “Focus on the Middle East Response”. Lebanon is newly eligible to receive an allocation for HIV. Jordan is not eligible for either HIV or TB, but under the Challenging Operating Environments (COE) Policy the Global Fund is able to provide support to Syrian refugees in Jordan. Lebanon hosts over 1.5 million Syrian refugees, as well as a large population of Palestinian refugees. Jordan hosts an estimated 1.3 million Syrian refugees. The Syrian crisis and the ensuing influx of refugees into both countries has placed their health systems under significantly increased pressure. Iraq is joining the MER for the first time under this grant. As reported in GFO 334 last year, Iraq was designated as ineligible for Global Fund support, and thus received just $6.7 million in TB transition funding for the 2014-2016 allocation period. Because of challenges driven by the internal and cross-border conflict associated with the ISIS insurgency, the Global Fund extended the transition funding through the end of 2017. Then it was determined that Iraq should join MER in 2019. To facilitate that, 12-month bridge funding was provided to Iraq for 2018—effectively a second extension of the 2014-2016 transition grant. The principal recipient of MER2, as with MER1, is the International Organization for Migration (IOM). The IOM, also served as the PR for Iraq transition grants, managed the grants out of its offices in Amman, Jordan. The MER1 began in January 2017. The MER2 funding represents a continuation and expansion of that grant, and will run from 2019 to 2021. The Global Fund published a brochure on the initiative in October 2018, which can be found here. Some overhead costs have been shifted to program budgets. The countries have developed contingency plans detailing actions that would be needed if the grant enters an emergency phase. In the malaria component, services have been scaled up, there has been engagement at the community level, and there is a strong bed-net tracking system that is being presented as a best practice. HIV. According to data from UNAIDS, Lebanon, Jordan, Syria and Yemen have a low incidence of HIV. HIV interventions are focused on the total population in Yemen and Syria, the Syrian refugees in Jordan, and Syrian displaced populations and affected host communities in Lebanon. HIV investments focus on prevention interventions among key and vulnerable populations, with an emphasis on scale-up of HIV testing and linkages to HIV care and treatment services. TB. Yemen, Iraq, Syria and Lebanon have a moderate incidence of TB; Jordan has a low incidence. Programmatic management of MDR-TB has been initiated in all five countries with financial support from the Global Fund but is still not fully implemented. Iraq received transition funding for the 2014-2016 allocation period because the country was reclassified as upper-middle-income. However, under flexibilities provided in the Challenging Operating Environment (COE) Policy, Iraq’s TB component regained eligibility for the 2017-2019 allocation period. It is on this basis that Iraq’s TB component is included within the scope of this grant. Malaria: Malaria has historically been a major public concern in Yemen. Somewhere between 60% and 78% of Yemen’s 2.2 million population live in malaria risk areas. MER2 aims to support prevention and reduction of the impact of malaria outbreaks by early detection and timely responses – with implementation of effective malaria control measures through activities organized around vector control and case management. The Secretariat granted a waiver for the co-financing requirement for the MER2 countries in light of the protracted emergency situation in these countries. Although MER2 does fund services in several countries, it is not grouped with the other “multi-country approaches” grants, which form one of the catalytic investment modalities approved by the board for the 2017-2019 period. Thus the $36.4 million for MER2 does not come out of the $260 million set aside for the formal multi-country grants. Rather, it represents a combining of the allocations of participating countries, insofar as they have allocations.